The game is played over several rounds (called voyages). In each voyage, 3 punts are loaded with wares and set sail for Manila. At the beginning of each voyage, the office of the harbor master is auctioned. The office is important, as only the harbor master can decide which wares will be loaded and where the punts will sail from, giving some advantages over others. The harbor master is also the only one able to buy a new share as an investment in the future. Once the harbor master has executed the duties of his office, all players hire accomplices to help them earn money on the voyage. At the end of each voyage, players receive profits for successful accomplices. Wares, which reach Manila, rise in value on the black market. The game ends as soon as one ware value reaches 30. The player who has accumulated the largest fortune is the winner. The player who bids highest, becomes the harbor master. Each player takes 30 pesos. 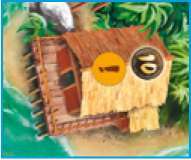 Place the remaining coins as a harbor cash box next to the game board. When playing with just three, each player takes four accomplices. Each player gets 2 of the well shuffled shares and looks at them without showing them to the other players. 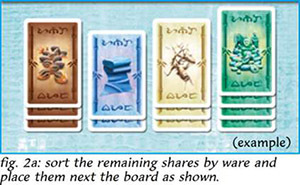 Now sort all remaining shares by ware and place them next to the game board (see fig. 2a). Place the four value indicators on space "0" of the black market table, matching their colors to those on the table (see fig. 2b). Place the punts, ware loads, and dice next to the game board. The game is played in several consecutive voyages. The office of harbor master is performed. For the first voyage, the oldest player starts the auction with a bid of at least 1 peso (or passes). For subsequent voyages, the player who was harbor master for the previous voyage, starts the bidding. If the starting player passes, his left neighbor begins, and so forth around the table, in clockwise order. The auction continues in clockwise order, with each player, on his turn, passing or offering a higher bid. Once a player has passed in the auction for a voyage, he cannot re-enter the bidding at a later point. The auction continues until all have passed, but one. This player has won the auction. He pays his last bid amount to the harbor cash box and is now the new harbor master. If no player bids in the auction, the previous harbor master retains the office for this voyage. No player may bid more than he is able to pay. A player may take a loan by encumbering any of his shares, to get the money he needs to pay his bid. has to place the punts in the water. 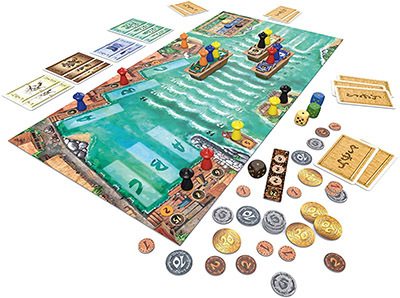 The harbor master may take a desired share from the game board. He pays the cost to the harbor cash box and places the share face-down with his unencumbered shares. The cost of a share is determined by the current value of the ware on the black market. It is at least 5 pesos. Now the harbor master loads one ware on each of the three punts. It is his decision alone, which ware he does not load (see fig. 4). Now the harbor master is to place the three punts in the water, thus determining their starting positions. For each punt there is a sea route on the board with spaces numbered from 0 to 13, ending at the destination port. The harbor master places each punt on one of the sea routes, but never two punts on the same sea route. When he places a punt, he places it on one of the start positions on the sea route selected, numbered 0 to 5. He must not place any punt in a position higher than space 5 (spaces 0 to 5 are marked to reinforce this rule). Note, however, that the sum of the numbers of the 3 start position MUST always add to exactly 9 (see fig. 5a and 5b). This phase has three accomplice placing rounds, each followed by a punt movement round. After the first accomplice placing round comes the first punt movement round, and so forth. In a game with three players there are 4 accomplice placing rounds and 3 punt movement rounds: after the first accomplice placing round, there is a second accomplice placing round. Then comes the first punt movement round. After that, the rounds alternate as in the four-player game. 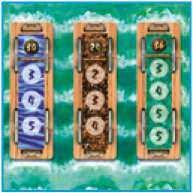 Beginning with the harbor master, and continuing in clockwise order, each player takes turns placing one of his accomplices on any vacant accomplice space and pays the amount shown on that space to the harbor cash box (exception: insurance). At any time, a player may choose to refrain from placing an accomplice on his turn. However, once a player has done so, he may place no further accomplices for this voyage. If a player has no money and is also not able to take out a loan he may place accomplices as "blind passengers" for free (see "take out a loan" and "blind passenger"). 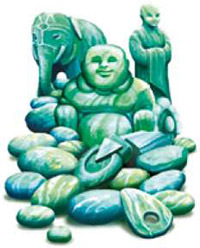 For ginseng, silk, and nutmeg, there are three accomplice spaces, and for jade there are four accomplice spaces. When a player wants to place an accomplice on one of the 3 loaded wares, he should choose the lowest-priced empty space of the desired ware. Each player may place several accomplices on the same ware punt, if the space is available on his turns. Punts already docking at the port cannot take any new accomplices. 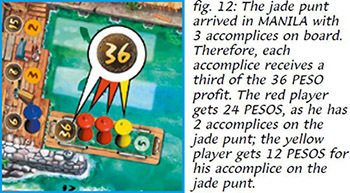 The goal of this action: to have accomplices on a punt that reaches the port destination on this voyage, so the player can share in the profits (see: phase III: "profit distribution"). 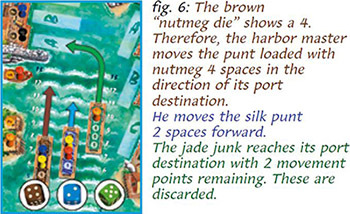 The risk of this action: if the chosen punt does not reach the destination port, there is no profit to share, and the player gets no return on his accomplice investment. At each port and shipyard space, there is an accomplice place. In addition to the punt placements, players may deploy their accomplices on any vacant port or shipyard space. 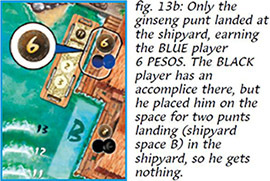 As with the ware spaces on the punts, a player can deploy several accomplices on port and shipyard spaces, when they are vacant on his turns. The goal of this action: to have accomplices on spaces where punts arrive at the end of the voyage, so the player can earn the payment shown above the deployment space. The risk of this action: if no punt reaches the chosen port, the player gets no return on his accomplice investment. In the pirate boat are two accomplice spaces. The first to use the pirate boat will take the front space and become the captain. If the captain space is occupied, the player places his accomplice in the second space. One player can have accomplices in both spaces. The goal of this action: the pirates may board a punt that ends the second movement round on space 13 and may plunder any punt that ends its movement on the third round on space 13. The risk of this action: if no punt reaches space 13, the player gets no return on his accomplice investment. The pilot island offers two accomplice spaces. When a player places an accomplice on one of these (vacant) spaces, he chooses between the "large" one, which is more expensive, but offers a better return or the "small" one. The goal of this action: before the third round of punt movement, the pilots have an opportunity to aid or hinder punts that have not yet reached their ports. Punts that reached their ports before round three cannot be affected by the pilots. The risk of this action: the exercised influence does not achieve the desired goal. The insurance office has an accomplice space. 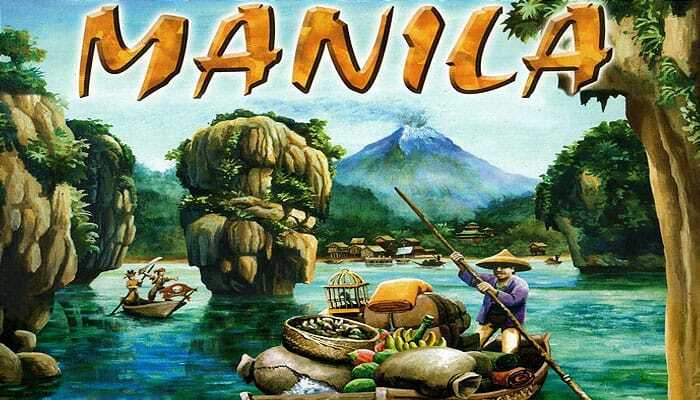 The player who places an accomplice here, pays nothing, but immediately receives an "insurance" payment of 10 pesos from the harbor cash box. 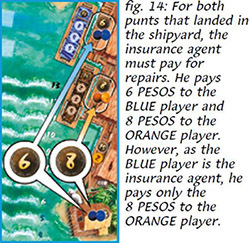 The goal of this action: if, after three movement rounds, no punt lands at the shipyard, the player keeps the 10 pesos insurance payment. The risk of this action: for each punt that lands at the shipyard, the insurance agent must pay the repair cost. In addition, the insurance agent takes over the profit disbursement to accomplices on those spaces. The harbor master rolls the three dice, whose colors correspond to the loaded wares. Then he moves each of the three punts - in any order - along its sea route the number of spaces shown on its die (see fig. 6). When a punt reaches its destination port with movement points remaining, these are "discarded". In no other case, may the harbor master choose to "discard" a punt's movement points. Each punt must move only on its sea route. Sea route changes are not allowed. Punts may not lose or exchange wares along the way. Each punt which travels past space 13, reaches its destination port of Manila. The first punt to reach Manila is placed in port space A, the second is placed in port space B, and the third is placed in port space C (see fig. 7). No port space can get 2 punts. 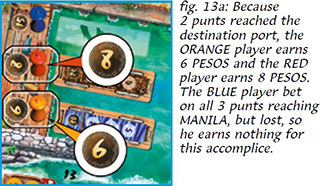 Punts, which fail to reach Manila after three movement rounds, are damaged and must be placed in the shipyard (exception: punts which end movement in rounds 2 or 3 on space 13 are affected by the pirates) and may or may not be placed in the shipyard. When only one punt fails to reach Manila, it is placed on shipyard space A. 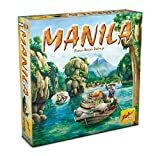 A second punt failing to reach Manila is placed on shipyard space B. 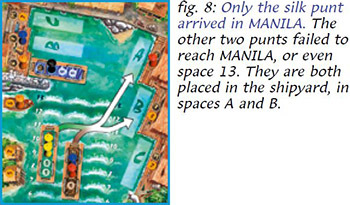 If all three punts fail to reach Manila, the last is placed on shipyard space C (see fig. 8). No shipyard space can get 2 punts. Note: immediately before the third movement round, the pilots have the opportunity to influence movement of the punts (see "the pilots do their thing")! When a punt stops on space 13 at the end of a movement round, the pirates attack the punt. Punts standing after the second movement round on space 13, are boarded by the pirates. Punts standing after the third movement round on space 13, are plundered by the pirates. A punt which arrives on space 13 other than at the end of a movement round, but by pilot influence, is not affected by the pirates (see "the pilots do their thing"). If there are no pirates on the pirate boat at the time of the punt's arrival on space 13, the punt is not attacked. To board the punt, the player moves his pirate to a vacant space on the punt. If there is no vacant space in the punt, it cannot be boarded (see fig. 9). The pirate captain (forward space in the pirate boat) may board first. After he boards (or refrains from boarding), the second pirate may board. The choice to board or not is solely the choice of each pirate in order. Each may choose to remain on the pirate boat in the hopes of later plunder. When the pirate captain boards a punt, the second pirate immediately becomes the pirate captain, moving to the forward position in the pirate boat. If there are several punts standing on space 13 after the second movement round, the pirates are free to choose which, if any punts to board, but must board vacant spaces only. Note: players can increase the power of pirates somewhat by using the rule variant described at the end of these rules. All accomplices on the punt are removed and returned to their players. The pirates receive the income for each plundered punt from the harbor cash box (see chapter 3: "profit distribution"). 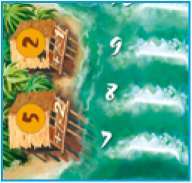 Now, the pirate captain decides for each plundered punt separately whether it lands at the port or the shipyard. If he chooses the port for a punt, the value of the plundered ware rises in value (see "ware value rising"). When a punt stands on space 13 after the third movement round and there are no pirates on the pirate boat, it is placed on the next vacant port space. and is treated as if it arrived at the destination port. At the end of the last accomplice placing round (just before the last punt movement round) the pilots may use their influence on the movement of the punts. Pilots may not influence punts which have already reached Manila. The "small pilot" (on the space costing 2 pesos) goes first. He may move one punt either forward or backward by one space. When a pilot moves a punt past space 13, it has arrived at its port destination and he places it on the next vacant port space. When a pilot moves a punt to space 13, nothing happens (the pirates only attack immediately after the movement round). The harbor master may only roll the dice to move the punts in the third movement round after he has given the pilots the opportunity to execise their actions. Each pilot decides independently whether to use his influence or not. Thus, for example, the small pilot can choose to refrain, while the large pilot use his influence. As soon as all punts have been moved in the third punt movement round and all punts have been placed on port or shipyard spaces, the profits are now paid. Pirate accomplices earn a profit only if a punt ended movement in space 13 at the end of punt movement round 3. The pirates plunder these punts, dividing the profits (value printed on ware load) equally between them. If only one pirate is on the pirate boat, he receives the entire profits from the plundered punts. All accomplices on the plundered punts are returned empty- handed to their players (see fig. 10). 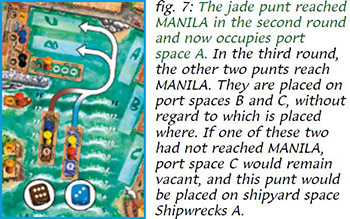 Loaded ware accomplices earn profits only if their punt arrived in the destination port of Manila. On each ware load is the amount of profit to be earned, which the accomplices share equally among themselves (see fig. 12). All accomplices on a punt that was damaged and sent to the shipyard, go home empty-handed. Port/shipyard accomplices earn a profit only if a punt landed at the port or shipyard space where they were deployed (see fig. 13a, 13b). Above the deployment spaces are printed the amounts of profit. The profit for port spaces is paid, in each case, from the harbor cash box. The profit for the shipyard spaces is paid by the insurance agent (if there is no insurance agent, it is paid by the harbor cash box). All accomplices deployed to a vacant port or shipyard space go home empty-handed. to the player who deployed an accomplice to the shipyard space where the damaged punt landed. to the harbor cash box, if no accomplice was placed on the shipyard space where the punt landed. The insurance payment is like a profit, which is paid according to the number printed above the shi- pyard space where the punt landed (see fig. 14). The insurance agent player may first take his profits for the voyage before paying for the punt repairs. If he does not have enough cash to make the payments, he must take out loans to cover the missing amounts (see "take out a loan"). If he cannot raise enough cash, even with loans, to pay the entire amount, he pays all that he can and the rest comes from the harbor cash box. The player does not have to repay the amount paid by the harbor cash box in this case. Each player who has unencumbered shares, can, at any time, take out a loan from the harbor cash box, by encumbering one or more of his unencumbered shares. To indicate the share is encumbered, the player places it apart from his unencumbered shares face-down in his play area. he may not bid for the office of harbor master with an amount higher than he could raise with his current cash and available loans. he must take all the loans he can and pay for the repairs as insurance agent until he has no more unencumbered shares- the remaining amounts will be paid by the harbor cash box (see "the insurance pays"). Each encumbered share may be made unencumbered by repaying the loan, plus interest, for a total of 15 pesos to the harbor cash box. The player places the now unencumbered share face up back with the other unencumbered shares in his play area. He can, of course, use the share again to take out a loan, if necessary. 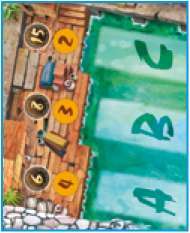 At game end, the players must pay back 15 pesos for each still encumbered share in their play areas (see "game end and the winner"). A player who has no cash can place an accomplice for no cost ("blind passenger"). When a player has no cash (and has no unencumbered shares with which to take out loans), he becomes a "Blind Passenger", he may place an accomplice as a blind passenger on any vacant place of any punt for no cost. All other spaces are not available to him until he has cash once more. If after adding all cash and loans, the player still comes short of paying for the least expensive space, he can still place his accomplice on this space but must pay all his remaining cash to the harbor cash box. Wares, which reach the port, rise in value up by one space on the black market table. All wares, which were delivered on this voyage to the destination port of Manila, rise in value. To do this, move the value markers for these wares on the black market table up by one space (e.g. from 0 to 5). Wares that did not reach the harbor remain the same in value. Next, to prepare for the next voyage, all punts and ware loads are placed at the edge of the game board. The players take all their accomplices back. The next voyage begins with the auction of the office of the harbor master. As soon as the value marker for at least one ware reaches 30 on the black market table, the game ends. 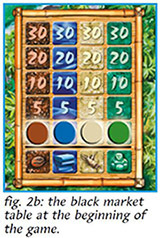 Each player counts his cash (pesos) and adds to this the value of his shares (the value of the ware as shown on the black market table). From this sum, he subtracts 15 pesos for each encumbered share (loan not yet repaid). This final total is the players fortune. 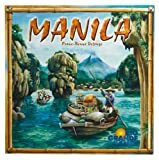 The player with the highest fortune is the most successful merchant in Manila, and the winner of the game! The pirates are allowed to board a punt even if there are no vacant spaces on them. 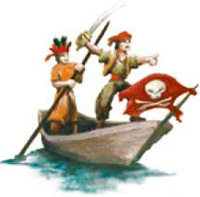 The boarding player removes one of the accomplices on the punt, returning him to his player, and puting his pirate in his place. If, however, there are vacant spaces on any punt on space 13, these must be filled first by the pirates. Only when there are no vacant spaces can a pirate displace an accomplice on a punt. If both pirates board the same punt, the second pirate may not displace the pirate captain who just boarded the punt.